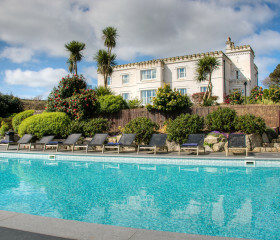 Life’s an inside-out thing at Cornwall’s Halula Beach House. Spaces are grand but you’ll be drawn to the outside deck with heated pool and hot tub. 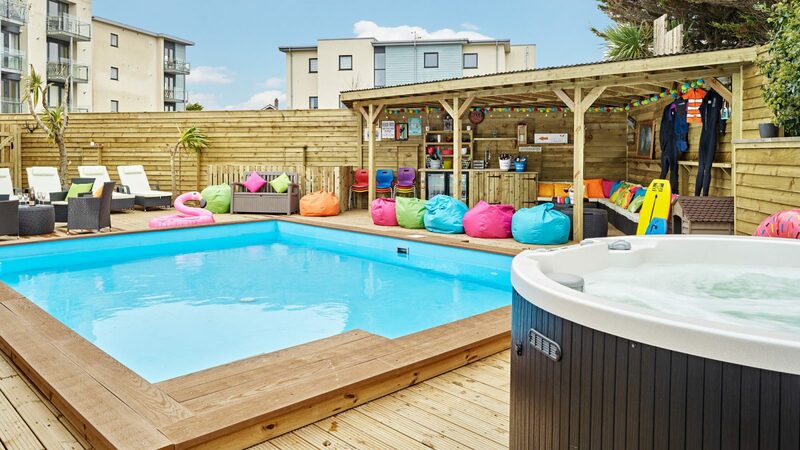 Chill on the beanbags, fire up the barbie, rinse off the sand in the hot shower. 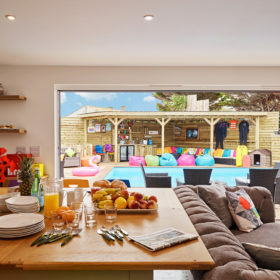 Inside, a kids’ playroom and Sky TV make for feel-good fun right next to funky Fistral. British childhood memories are built around Cornish holidays. 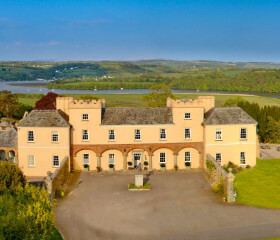 The sleepover in the Somerset layby on the way. The first glimpse of the sea. Palm trees on the front. 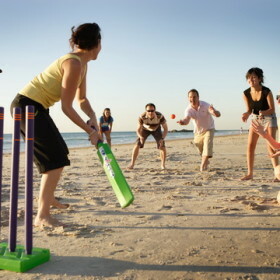 Buckets and spades on the sands. 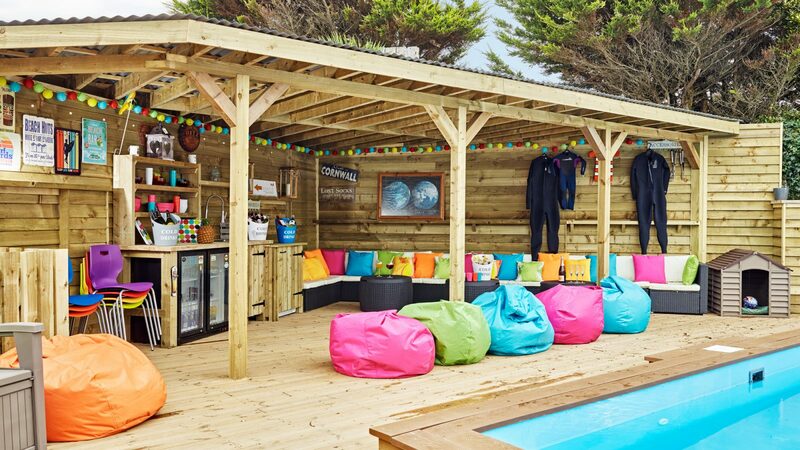 And now you can do it all in a place that’s surf-school cool with its own heated pool and hot tub. 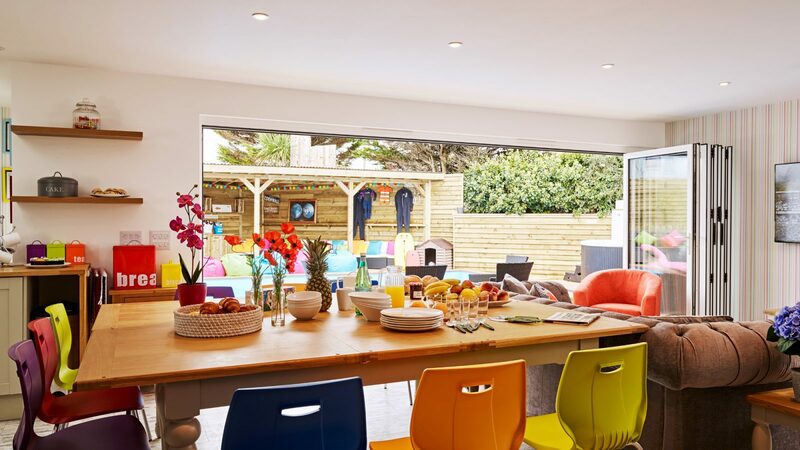 Halula Beach House, off fashionable Fistral Beach, is as exotic as it sounds, with a huge covered deck dotted with rattan chairs, colourful bean bags and fairy lights. There are hooks for hanging wetsuits, a double lab-sized kennel, and a beachy heated deck shower for de-sanding. Why not hang up your business suits? Halula is great for corporate events. 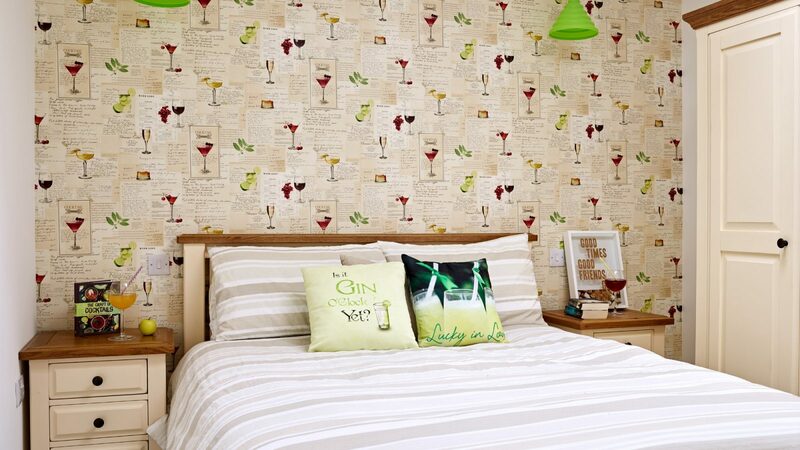 With easy access to and from London, you could be set with a cocktail by the pool before the sun’s gone down. 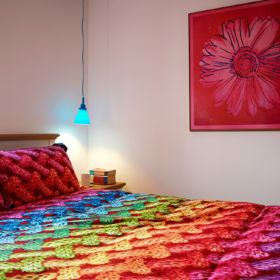 Inside, high-quality furnishings and bright colours make for a fun and funky stay for up to two dozen. Two big TVs come with full Sky package and the kids’ playroom awaits, with games, toys and Finding Dory play table. 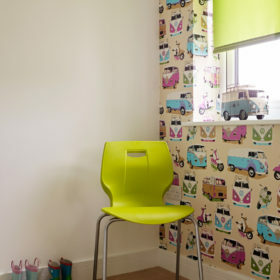 Bedrooms, with kiddie-centric Cornish themes, include the Campervan, the Nautical Suite and the Flip-Flop. Eat inside, eat out, around the huge west-wing table with the doors open to the deck, or by the pool in the shack with the barbie sizzling and the kids splashing around. Sleep long and deep in comfortable cotton to the lulling sound of waves and gulls. Wake to another fabulous Fistral morning and do it all again. 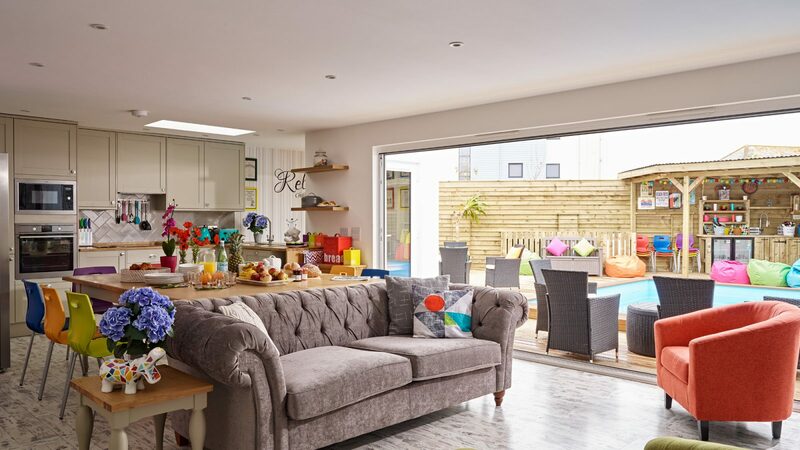 Fling open the French doors to the garden, let your music flood out over the terrace, and curl up in the ‘nook’ with a book or iPad while the kids leap into the pool, heated to 29 degrees. This is the perfect post-beach retreat, whether you have two legs or four. Bring your pooch and de-sand in the warm outdoor shower and hang up your cossies and wetsuits on the hooks. At night, there’s a kennel under the stars large enough for two labs. 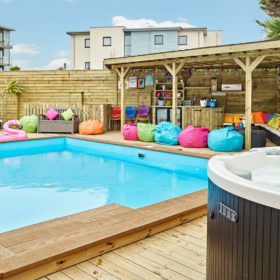 Chill with cocktails in the bubbling hot tub, raid the outdoor fridge, laze around on lilos in the pool, or eat, drink and be merry out here on the rattan chairs, the multi-coloured beanbags, the easy chairs, sunloungers and bench. 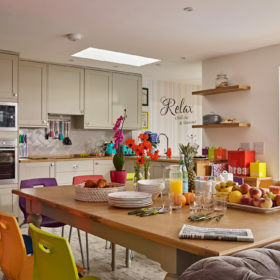 A kids’ table is perfect for drinking, snacking and playing. Outdoors? It’s the new in. 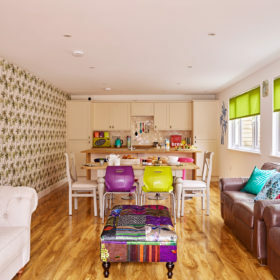 Relax, party, or do anything and everything in between in a house offering luxury living, whatever your age or expectations. Furnished with love, Halula Beach House is bright and light, bursting with high-quality finishes and all the colours of the rainbow and more. There are spaces here to come together and others to escape, read and chill. Speakers sit ready to relay your favourite music and two large-screen TVs with full Sky package make movie nights possible. Just dim the lights and add popcorn. There’s Wi-Fi throughout for iPads or firing up Facebook. 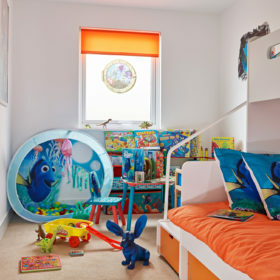 Kids can find the Finding Dory bedroom and play in the half that’s given over to pure fun, with games, toys and a mini Finding Dory table for colouring, drawing or Playdohing. Dinner for two dozen? No problem in the west wing at Halula Beach House. In the east wing, there’s room for six more. 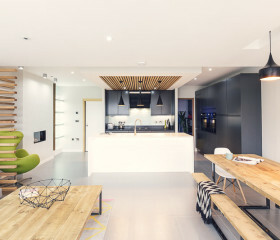 In both, state-of-the-art kitchens gleam, beckoning you to summon up a stew on the two electric fan ovens and electric hobs. Two large fridge-freezers swallow up your Tesco deliveries. Outside, the shack by the pool comes heated and ready for informal dining, aided and abetted by the barbie, sink and large fridge. 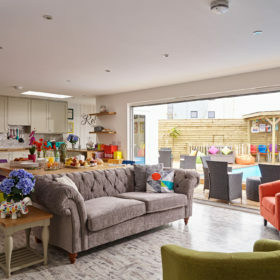 Fire up the flames and get grilling, If that’s all too much, summon our chef and let us take over while you all chill on the rattan sofas, easy chairs and colourful beanbags. Catch the farmers’ markets at Bodmin, Bude or Helston for cheese, venison and veg, or try great takeaways such as Morris Pasties in Newquay, Indian Summer, Domino’s, or maybe fish and chips on the harbour wall from Rick Stein’s place overlooking Fistral Beach. Eat out at restaurants such as Bodhi’s, high on the cliffs above South Fistral beach, The Stable for pizza or Café Cloud for cream teas. 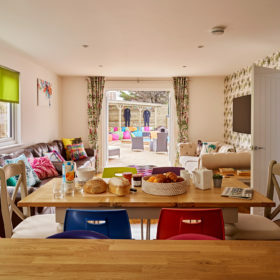 Try the Harbour Rest Café for big Cornish breakfasts, or the thatchy Smugglers’ Den Inn, complete with beer garden and children’s play area. Stop by Lewinick Lodge restaurant any time of the day for the best in breakfasts, roasts and cheese boards, complete with a full bar and great sea views, in walking distance from the house. 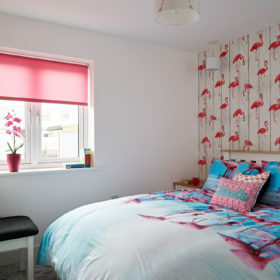 Bedrooms here come with a seaside splash of themed adventure. We’ve got ten in total, six in the west wing and four in the east. And there’s more comfort in the shape of three double shower bathrooms and two further bathrooms with baths and over-the-bath power showers. 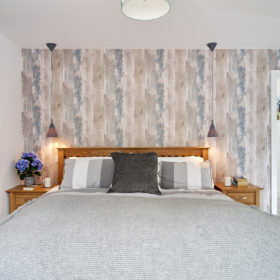 Head to the west wing – be quick – to claim the ‘Nautical suite’, a super king-size bedroom with patio doors directly out to the sunsoaked terrace and a double shower en-suite. 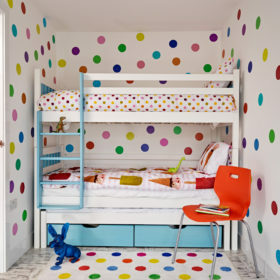 The triple-bunk Flip-Flop and Dotty bedrooms are perfect for your crazy clan, while the Cocktail, Stripey and Flamingo are king-size grown-up havens. In the east wing, you’ll find the Heart suite, complete with super-kingsize, double doors onto the terrace and double shower en-suite. The Campervan is another triple bunk, as is Finding Dory, which also comes with playroom packed with games, toys and Finding Dory play table. 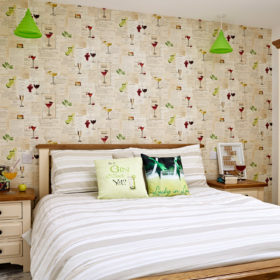 The Butterfly bedroom is another sumptuous king-size. 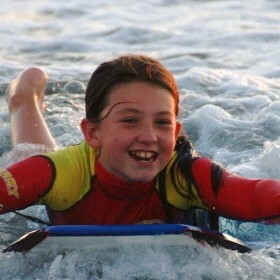 What do kids love to do on holiday? Swim. 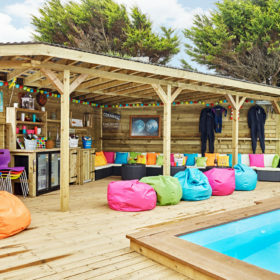 Well, good news – the outdoor heated pool at Halula Beach House is heated to 29 degrees and serves as a great post-beach hangout, with hooks for your cossies and wetsuits and even a large fridge in the party shack for snacks and lemonade. 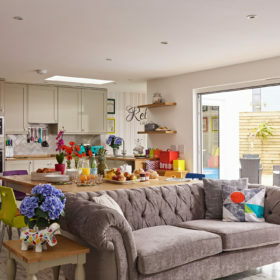 Pull back the bifold doors and pull up a brightly coloured beanbag. You can stay here all day, dipping in and out of the pool and hot tub and venturing over to the play table. Inside, a little exploration will take you to the Finding Dory room, complete with toys, games and Finding Dory play table. Wind down a long day in front of the two large-screen TVs with full Sky package, then choose from bedrooms with kid-friendly names, such as Flip Flop or Butterfly. 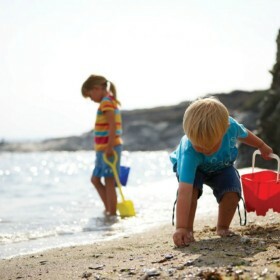 A Cornwall holiday for kids is all about sun and sand, coves, rock pools and pirates. But memories are made in happy holiday homes, too, and Halula Beach will delight, both inside and out. There are seven beaches for sunshine, sandcastles and swimming. There are tractors to ride and cows to milk at Dairyland Farm World. And real pirate adventures to be had at Pirate’s Quest. 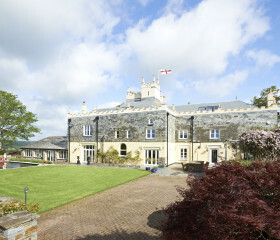 Grown-ups can shoot clay at St Column, walk the spectacular south west coast path, or surf the wild north-coast waves.